Are you looking for the best MIDI keyboard controllers? Then this article will help you a lot! We have listed some of the top rated MIDIs in the market today for you to see. Of course, we have taken into account each of these features to make sure that we got it all covered for you. MIDI keyboard controllers are getting popular as days are passing. In fact, the growth of these new musical instruments is so unprecedented that they just happened in just a few years time. With the help of various technological advancements, devices like MIDI keyboard controllers are becoming accessible to many musicians. Using a digital setup brings a lot of conveniences. However, it is undeniable many still glorifies the quality of analog and tradition equipment. Regardless of your preference, integrating both analog and digital technologies can enhance the overall output that you can produce. At this point, it is time for you to know the best MIDI keyboard controllers. We listed different options for you. In this way, you can choose depending on your preference, need, or budget. So what are you waiting for? Read on! It is undeniable that the Akai Professional MPK249 is among the most popular MIDI keyboard manufacturers today. 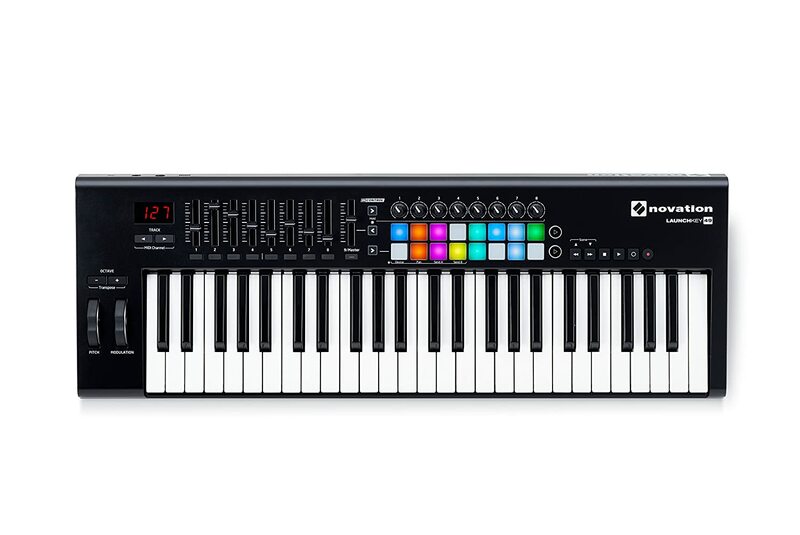 Their first MPK series was able to dominate the market for many years. Because of this, Akai became one of the most preferred options when it comes to MIDI instruments. Today, they have released another upgrade for the original MPK. And that is in the form of MPK249. MPK249 has a convincing quality. When it comes to stability and functions, the Akai MPK249 lacks nothing. Moreover, you can also get a software bundle upon the purchase of this product. 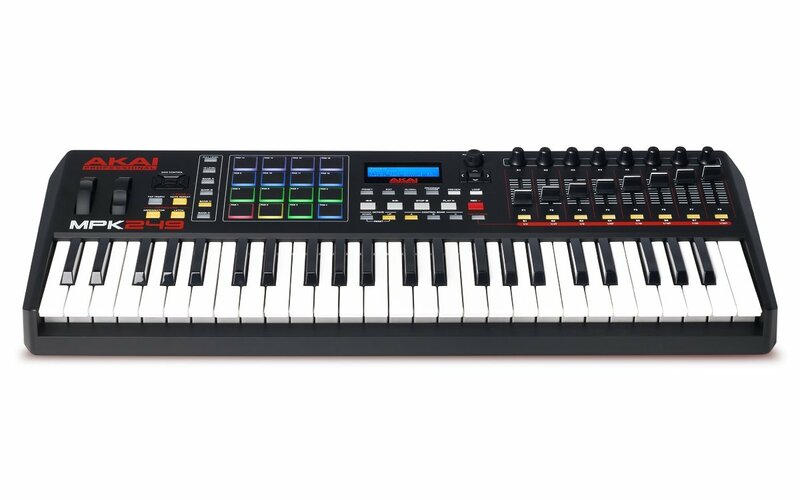 This MIDI equipment is also available on various key count models. Not to mention, all of these versions have the following essential software: Ableton Live Lite, SONiVOX Twist 2.0, and AiR Hybrid 3.0. When it comes to key make, we can confidently say that the Akai MPK249 is the most sturdy. It is ultra responsive and sensitive as well. Meanwhile, it comes with a drum pad that you can provide you various sound assignments. Keys are semi-weighted and full sized (comes with aftertouch). Drum pads are velocity sensitive (have four possible banks). ​LCD interface is high resolution. ​Comes with octave controls and pitch bend wheel. ​Control knobs and assignable faders are present. It is an expensive choice. Installing the software is quite difficult. 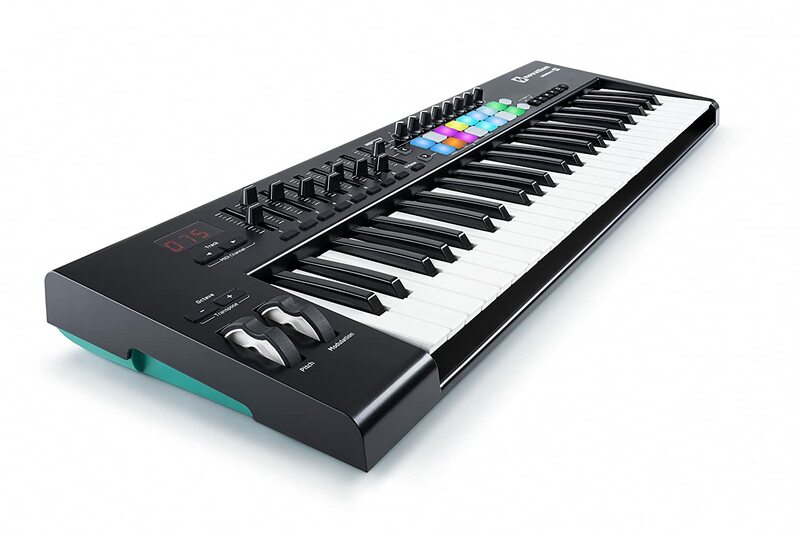 In the present, we can say that the Novation Impulse is among our favorite MIDI keyboards. And such opinion is not correct to us. Many musicians regard the impulse as one of the best MIDI controller available in the market today. Since is it a creation of Novation Music, you will just get mesmerized to the quality of its build and performance. Despite the availability of multiple features (such as drum pads) and other functions, the price of Novation Impulse is still half lower than its competitors. It is quite surprising considering that the caliber of its build is identical to other high-end brands. From the quality of the keys down up to sound clarity, this pedal is simply outstanding! This particular keyboard is available on the following key counts: 25-key, 49-key, and 61-key. Semi-weighted keys are very responsive. ​Availability of options (9 buttons, 9 faders, and 8 knobs). ​Comes with an Automapping software so that you can easily control the MIDI. ​It also have sustain and expression pedal inputs as well. It doesn't come with a software bundle. The response keyboard is somehow similar to synth action. 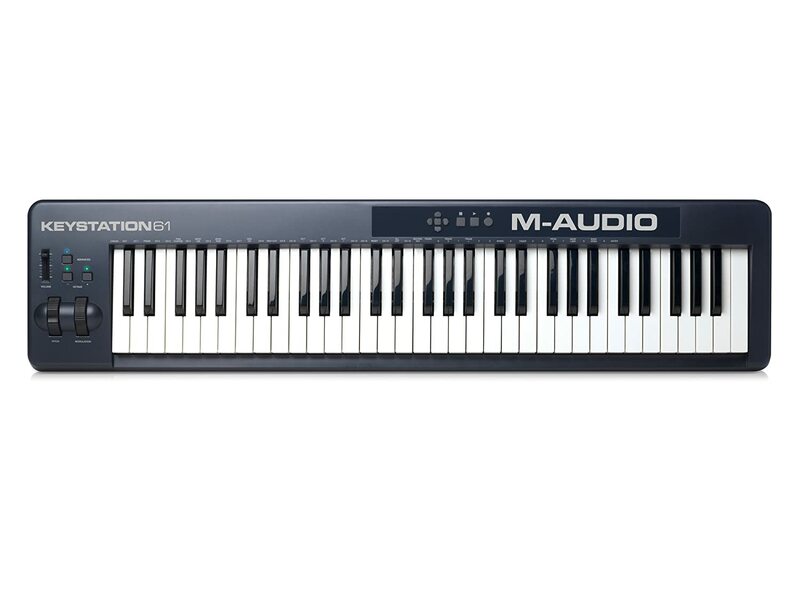 For those that are tight on budget, the M-Audio Keystation 61 II is the perfect option. Just by looking at it, this MIDI keyboard is plain and straightforward. It doesn't have those extra controls and pads. Of course, advanced practitioners might not like it. But for amateurs and starters, this controller is a good choice. The quality of its keys is excellent, despite being a synth-action keyboard. It has a nice reaction and sensitivity when you press it, which we like. It also got an orchestra theme VST, which is in the form of the "Eighty-Eight Ensemble" of SONiVOX. Installing this software is relatively easy, so you don't worry about anything. 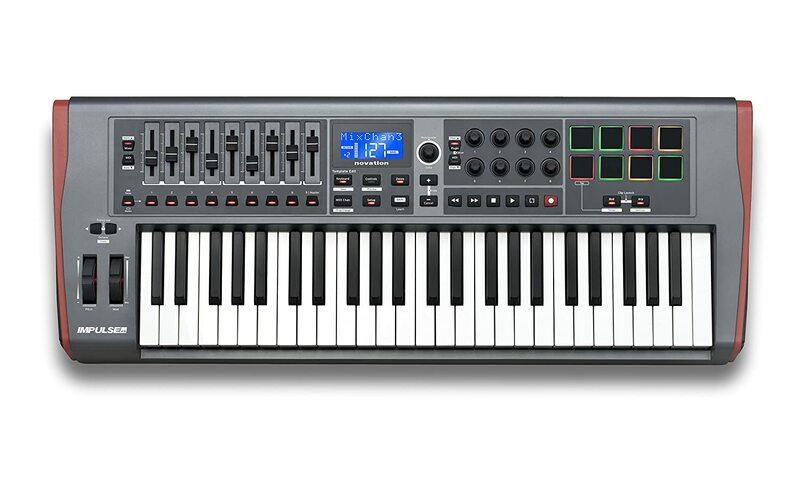 Most of the basic controls, such as faders and knobs, are present in M-Audio Keystation 61 II. If you are looking for a straightforward setup, this keyboard is the right one for you. ​Comes with mod wheels and pitch bend. ​It has a sustain pedal input. ​The controls are intuitive and ergonomic. Not an ideal choice for experimenting and professionals artists. The springs in the key are relatively stiff. Novation Launchkey is a good alternative to Impulse. Although it is not as good as its cousin, its performance is indeed impressive. The first thing that you should know is that the Launchkey is cheaper compared to Impulse. Of course, this means that its features are lesser, too, compared to its counterpart. But we are not saying that it is a crappy MIDI keyboard controller. In fact, we can say that the Launchkey is way better than the majority of MIDI controllers nowadays. It comes with drum pads and possesses assignable buttons and faders. It also got mod and pitch bend wheels as well. When it comes to stability and build, we can't say anything bad about the Launchkey. After all, it is a Novation product! Software like the Bass Station VST and Novation V-Station are all available in this bundle. You can also access some parts of the device via the Novation apps on Apple products. 16 trigger pads are velocity-sensitive. It got the InControl technology so that you can configure various DAW mapping. ​Synth-action keys are ultra responsive. ​Faders and buttons are assignable. Involves a lot of tweaking before you can operate it fully. Another M-Audio Oxygen 49 MKIV product that we have given our due respects it the Oxygen. The reason for such is simple: this MIDI keyboard controller is budget-friendly but highly functional. Given its price range, it is quite surprising that it has pads, encoders, and other forms of controls. They quality of the keys of M-Audio Oxygen 49 MKIV is impressive, too. Specifically, it has a full-sized, synth-action keys. Moreover, the keys are pretty sensitive, too. Meanwhile, it has high compatibility with any DAW. Getting this product will also entitle you to free SONiVOX and Ableton Live Lite software. Investing on this MIDI keyboard controller is never a regrettable choice. It has the essential features that you need at a price that won't hurt your budget! ​It has 9 faders and 8 knobs (all assignable). ​It has mapping compatibility with many DAWs. ​Trigger pads are velocity sensitive, too. You cannot remap the drum pads. Difficult to configure if you are using ProTools. Before you choose a keyboard controller, it is essential that you know the primary considerations for this type of digital instrument. As you can see, there are a lot of choices for MIDI keyboards. The price range could start from $100 up to $600 or more. In short, it is not a cheap investment. Therefore, you must be careful when you are scouting which one to get. Usually, those MIDI keyboards that have extra keys are expensive. Moreover, those that have extra packages (such as software and downloadable contents) may charge you more compared to those that have none. But of course, it doesn't mean that they are your best choice on the go. It will depend on your skills and needs. There are a lot of options when it comes to this aspect. An example of that would be the 25, 32, 37, and 49. These type of keyboard controllers are usually referred as mini-compact. They are inexpensive, but at the same time, their functions are limited. Meanwhile, the most popular ones are the 61-key MIDI keyboard controllers. Many intermediate players nowadays are now using this kind of keyboard. If you want a professional-grade setup, then you should go for the 88-key MIDI keyboards. The latter is already equivalent to a standard piano. If usability and number of applications are the cut, then the 88-key setup is the best. But if you want a portable one, then go for mini-compact controllers. Aside from the number of keys, it is pretty important for you to decide what kind of mechanism do you want for the keys. Specifically, the are three types of key-make that are available in the market today: semi-weighted, full-weighted, and synth-action. In this aspect, your preference is the major deciding point. Synth-action - Many of the MIDI controllers nowadays are using the "synth action" mechanism on their keys. These keys are made of plastic. Moreover, they use springs rather than weights for the retracting motion of the keys.The general "feel" for synth action keys are light and quick. You can use them on multiple applications since it can be ideal on any genre. Semi-weighted - Semi-weighted keys are not using plastic and spring. Yes, it is true that it is using a spring-loaded mechanism for the retraction. But there are actual light weights that are placed in the center of the key. You can immediately tell the difference the semi-weighted key to a synth action key just by a single press. Full-weighted - Of course, it is important for many musicians to get the "feel" of a real piano. Therefore, even with digital MIDI keyboards, fully weighted keys still hold absolute importance. Let us be straight. Digital pianos with fully-weighted keys do not offer the exact sensation that standard keyboards have. But they are close. Close. 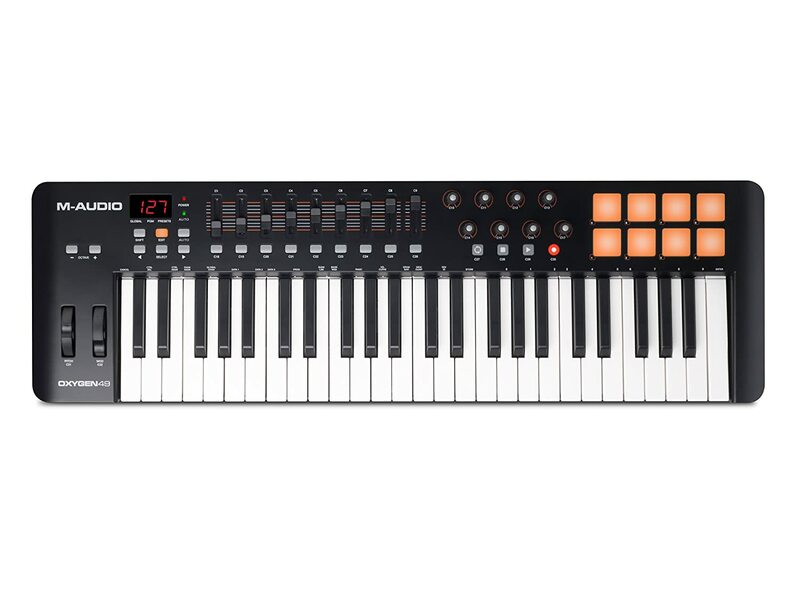 Moreover, finding MIDI digital keyboards that have weighted keys is quite difficult. If you can find them, there is a high chance that they are expensive. "Aftertouch" is another important aspect for digital keys. Obliviously, such kind of technology is not available to all MIDI controllers. Specifically, it is a data emitted when you apply pressure to the keys. It is commonly used to control the volume, vibrato, and other configurations of the keyboard. The most common type of aftertouch is the Channel. When you hold a key, the keyboard would only detect the aftertouch with the highest value. There is also Polyphonic aftertouch, which is the exact opposite of the Channel. But the former is quite expensive and rare. Size is a matter that you need to contemplate when it comes to MIDI keyboards. Are you always traveling? Or you just remain in your studio or room when creating music? These are the questions that only you can answer. As we mentioned, mini-compact MIDI keyboards are best for musicians that are always on the go. Meanwhile, 61-key and 88-key keyboards are ideal for those who doesn't mind portability at all. MIDI keyboards nowadays usually come with drum pads. These extra accessories are not solely for the purpose of creating drum sounds. You can also designate different sound to them. Usually, drum pads have an 8 to 16 count range. Moreover, they have 3 to 4 banks as well. Integrating pads to your MIDI keyboards will enhance your versatility. But it doesn't mean that they are necessary. Of course, a product that has additional features will tend to cost more. But at some point, they can provide value to your money. For example, MIDI keyboards that have arpeggiators, buttons, faders, and pitch bend wheels can drastically improve your performance. As we emphasized earlier, these are just additional components. They are not essential but it doesn't you won't benefit from them. You just have to weigh your skills and budget on this. Now that we got all these important aspects covered let us review the MIDI controllers that we listed in this article. Each of them has unique features that will guarantee you satisfaction and relentless performance. You just have to sift through each of them so that you can determine will work best for you. These are the best MIDI keyboard controllers that you can see in the market today. Each of them has excellent build and functionality. Although they have different features, it is undeniable that they are perfect for any applications. Among the products we featured, we hail the Akai Professional MPK249 as the best MIDI keyboard. 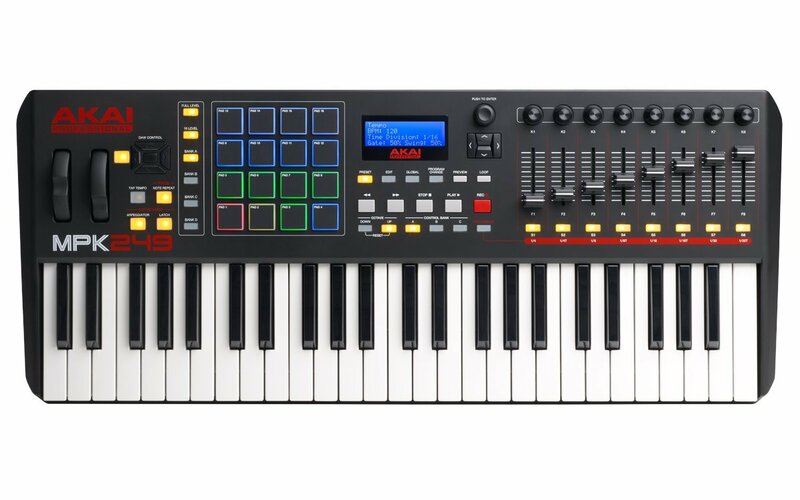 From the controls, interface, up to functionality, the Akai MPK249 exhibits excellence and stability. It has the most responsive key beds that we have reviewed. It is a great item that will never give your money a run. However, we still recommend that you try the rest of the controllers here. Who knows? One of them might benefit you more than the MPK249 can do? Did we miss something in this list? Are there other MIDI keyboard controllers that are worth mentioning here? Tell us all of your thoughts in the comment section below!